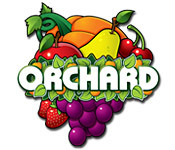 Orchard is rated 3.8 out of 5 by 11. Rated 5 out of 5 by FruityJoy from Nice Game About a Good Story, Good Graphics and Fun, if you are patient enough Really nice game, I definitely know, that back in 2009 those graphics were very decent. For todays graphics, meh, pretty ok pixelated 2D graphics. Has a short, but nice story along the levels, the sound is a great way to relax, plus the sound effects, are quite well made aswell. But after few hours of playing, I really put my headphones away, since it was a loop, it was getting quite annoying. Overall good work on that. The fun factor about this game - it's very fun, you need to be patient though, since every level runs quite slow from the beginning, if you are not patient, definitely don't recommend this game for you. Not much of a challenge, mostly takes more time from the next levels. Plus : -Very decent 2D Graphics for 2009 -Nice music and sound effects -Short but very good storyline -Would be a great challenge to speedrun all 9 levels in less than 10 hours Cons : -Since the music and sound effects are loop, gets quite annoying few hours in, could get atleast 2 - 3 more songs into the game -The character physics are really just OK, the game would be much enjoyable if the characters could noclip through the others -Not much of a challenge, since if you play like 2 hours a day, you'll get it in probably max. 1 week if you can manage profits Overall rating : 9.25/10 Definitely recommend this game. 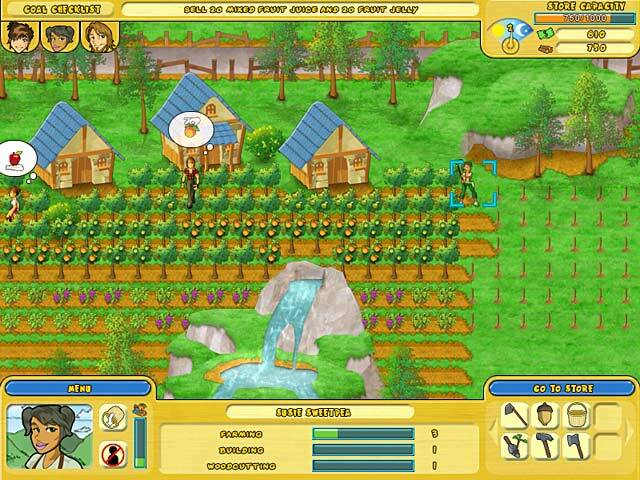 Rated 5 out of 5 by mratts from Great casual farming game I enjoyed the relaxed story where time wasn't a factor. The goals were fun and the mechanics were pretty good. Pros: Ability to play through story mode at own pace. This was not time management. You could potentially take weeks to play a level without penalty. Ability to hire helpers who are already skilled in some tasks. Logical progression of story. Upgrades and improved skills are really beneficial. Cons: Characters don't adapt well. If they are going to harvest a specific crop and someone else gets there first, they stand there watching. You have to make sure that your workers don't end up in the same spot or it will waste a lot of time. Placement of buildings is cumbersome and leads to a lot of wasted space. Not a lot of replay value, in my opinion. Sandbox mode puts you on the same small lots and there is only so much you can do in the space given. Overall, I really liked the game. I would love to see a better developed freeplay mode and some tweaks in a sequel. I would definitely get it! 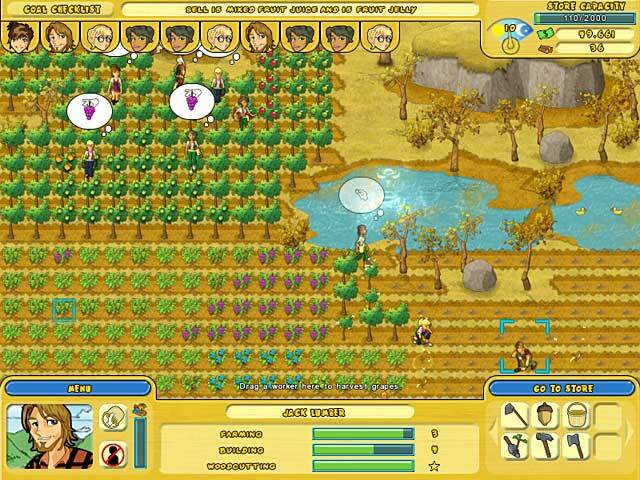 Rated 5 out of 5 by DazzleDice from Love this game Wish you would make a Orchard 2 with more levels . I love this game for passing time. Rated 5 out of 5 by Cheri_BDG from Enjoyable Business Sim Game Managing the Orchard starts slowly as you begin by yourself, and as one reviewer said, it feels like things are moving VERY slowly. This picks up quickly though as you begin to get employees, who move through most tasks on an automatic cycle so you aren't really having to "manage" their every move most of the time. 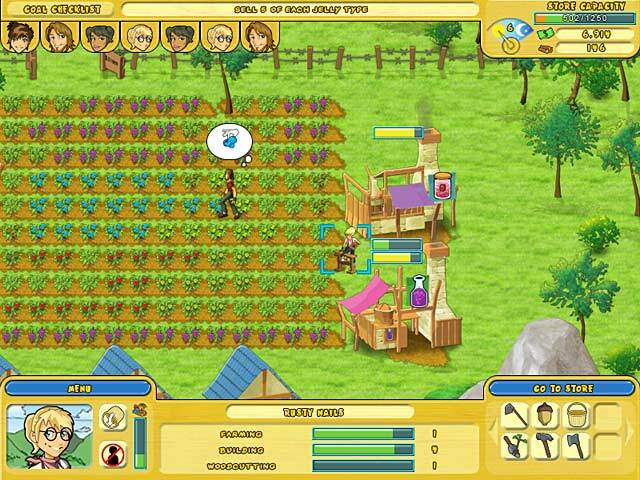 Tasks are broken up into 'farming', 'woodcutting', and 'building' and you can hire employees that specialize in any one of the areas, and they get better over time, along with your own abilities getting better over time. The harvested crops are either turned into other goods which are sold in the store, or the crops are just sold directly in the store too. Customers come by and buy things, and leave either happy, neutral, or unhappy. I've only played a short time (less than the full trial) and so far the goals are pretty linear, but it is up to you to decide where to build everything, and it makes it easy to learn the game as you go. I'm buying on the GameAgents sale this weekend! One of their few non-HO games. Try the trial, and enjoy! Rated 4 out of 5 by LAndersen from Old-school fun without time pressure I've recently finished this game. Yes, the graphics are rather clunky and the gaming screen fairly small (cannot be adjusted to full-screen#, but the main issue for me is always: did I have fun playing? And I did. To begin with, the music was foot-tappingly jolly. I think I only turned it off once, when I had been playing for a while and was afraid the tunes would get stuck in my mind! It's a fairly addictive game and the levels #there are 9) can be rather long, which I don't mind at all. You learn as you go and new elements are added along the way. But you also have to be prepared to think for yourself; how many workers are needed so crops are picked in time and not left to rot? Which upgrades are worthwhile buying? When and how much should I advertise? There are goals to achieve in order to finish a level, but you can take your time and experiment on how to reach them. You are awarded stars at the end, but who cares? I never found out what the criteria were for getting full marks. Some of the later levels got rather busy, but I managed three stars in all but one. In the game forum quite a few people are complaining about technical problems. I didn't encounter any, but do yourself a favour and try the game before buying, just in case. Rated 2 out of 5 by starrynightskye from Kinda dull I like TM games, but this one wasn't for me. I didn't even last through the free trial. Too slow, and you spend a lot of time waiting for tasks to be finished. Rated 2 out of 5 by mrsusafdemoman from Really old graphics and difficult to maneuver The graphics and speed of this game are older, it has a very blocky look, and doesn't run as smoothly as some of the newer games. The storyline was good, but it just ran too slowly and was not that fun for me because of how hard it was to maneuver the characters.